Coat a skillet with cooking spray and heat over medium high heat. Add the tortilla and cook until golden brown and crisp, about 3-4 minutes. Flip the tortilla over and cook for 2-3 minute on the other side until golden brown and crisp. Set aside. Warm the refried beans and beef in the microwave or on the stove. Spread some refried beans on top of the crisp corn tortilla then carefully spread some sour cream. 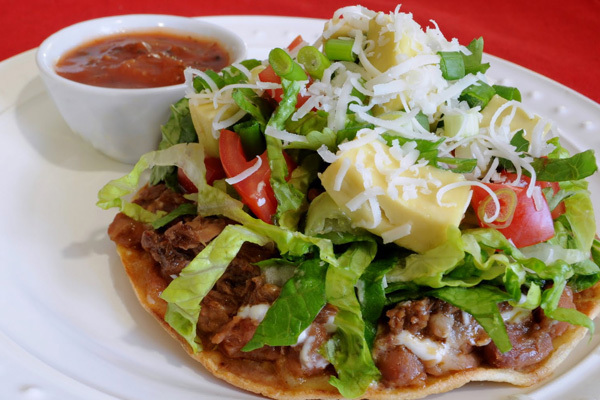 Add the shredded beef followed by the lettuce, tomatoes, avocado, green onion, cotija cheese, and cilantro. Serve immediately. Enjoy!